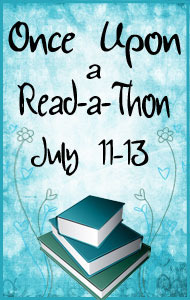 Today is Day 1 of the Once Upon a Read-a-Thon! Head on over to Pure Imagination to sign up - today's the last day to register for prizes! 7:00 AM - I am wiped! After finishing the assignment due later today (finally! ), I picked up my copy of Touched by an Alien and was promptly sucked back into the story. Alas, my eyes do not want to stay open too much longer. Nap time. Question #1: What is your favorite type of myth? I am definitely a fan of Greek mythology, mostly because I am very familiar with it. That said, I love to read about any type of mythology, especially those with which I am unfamiliar, because it gives me a chance to learn something new. Question #2: What is your favorite book with some type of mythology in it? Mini Challenge #2: Hosted by The Musings of ALMYBNENR is CRAZY! I'll have to come back to that one later - I only have half of the covers so far. 6:00 PM - Just finished Touched by an Alien! Loved it! I will have to pick up the rest of this series ASAP - Koch is a great writer. Off to exercise now, eat dinner, and relax with Boyfriend for a while. Hopefully will pick up a new book later on tonight. So glad you liked Touched by an Alien! I really enjoyed that one too though I haven't gotten to the other books in the series yet. I'm looking forward to getting caught up:) Good luck with the rest of the read-a-thon!